In a pretty surprising turn-of-events, we have suddenly obtained some very important news regarding the release of Harmonia! As was rumored some time ago, Harmonia was being planned to be released simultaneously in English and Japanese. 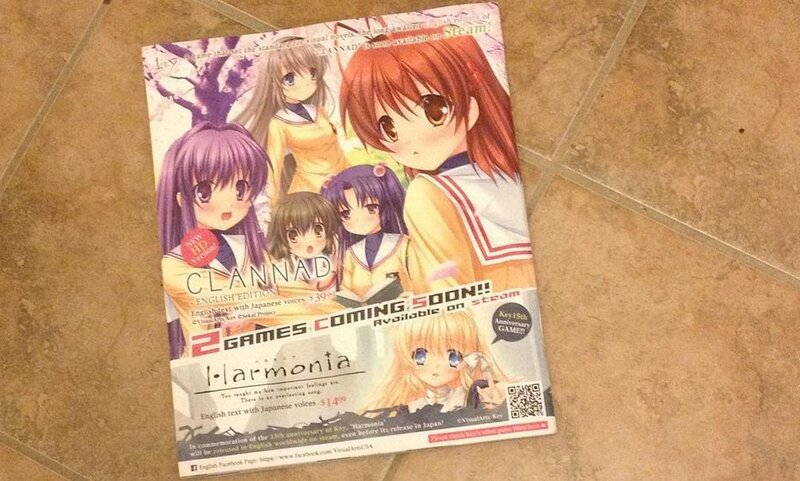 Recently, Kara Dennison, who is currently involved with Sekai Project, posted this picture on her Instagram showing an advertisement on the back of a yet-to-identify magazine, advertising not only the release of CLANNAD on Steam, but also confirming the release of Harmonia! From this picture, what we have confirmed is that Harmonia will be released on Steam in English text with Japanese voices for the price of $14.99. Furthermore, the advertisement also states that “Harmonia will be released in English worldwide on steam, even before its release in Japan!” This is some pretty amazing news, and the fact that it will get released overseas before Japan is one of, if not the first of its kind in the visual novel genre. What do you all think of this news? Personally, this is making me all the more excited for Harmonia, and I hope all of you are as well! Any other thoughts about Harmonia? Feel free to discuss more about it in our Pre-release Discussion and Speculation topic on the forums. Credits to @Doublethree1 on the forum for sharing this news on the forum. Resident Kazamatsuri.org writer that attempts to decrypt moonrunes to give you the news that we all can’t read.